Today marks the end of our RWA 2013 National Conference blogs. We hope you've enjoyed taking this journey with us. We're wrapping things up with some overall highlights of the conference, including one of our favorite parts: RWA Glam! Sit back, enjoy and be sure to leave a comment to be in the running for today's RWA prize! PJ: It's always a thrill to share first-time book signings with friends but this year was special in that I had five good friends signing their books at RWA National for the very first time. Congratulations to Manda Collins, Terri Osburn (both pictured in yesterday's blog), Nancy Northcott, Joan Kayse and Suzanne Ferrell. It was such a pleasure to share this experience with you! Tuesday’s highlight – My first highlight of the conference came before I had even reached the Marriott Marquis Hotel. Because I live so close, my husband and I had planned that he would drop me off at the hotel to save on parking fees. When I found out that Lisa and Marni, my and PJ’s roomies, were flying in around the time we’d plan to arrive, I told them we’d pick them up on the way. What a thrill to finally meet Lisa Lin after knowing her online for years! She is just as sweet as her online persona. And I knew right away that Marni Bates was going to be a fun gal! PJ got there right before we did and we all checked in together—perfect timing! PJ: One of my favorite experiences at last week's conference was sharing an elevator with an unpublished writer who was practicing her book pitch for an upcoming appointment with an editor. I offered to let her practice on me. By the time we reached my floor, I was giddy with excitement about her book (What can I say? I ♥ hockey!). We exited the elevator together, she going right and me turning left toward my room. A few minutes later, I was trying to figure out why my key card wasn't opening the door. I quick look at the room number gave me the answer. I was so excited about her book pitch, I got off on the wrong floor! I got an email from her this week letting me know the editor had been excited too. She was asked to submit a full manuscript. Best wishes to PJ Ryley! Maybe some of that kismet that put two PJs on the elevator together will rub off on your manuscript. Here's hoping I'll get to read that book one of these days! Andrea: Wednesday’s highlights – Hands down, the Literacy Autographing was a high point (as we blogged about yesterday), but before the signing I was introduced to an author I have known online for many years and had yet to meet…until now. Cathy Maxwell is just as funny and bubbly in person as she is on the Internet. I just adore her! I got to chat with her a little more at the Avon publisher signing and at the Avon party. Andrea's Thursday’s highlights – Thursday was chock full of highlights! It was another day in which I met online friends in person for the first time! PJ and I had lunch at the historic Mary Mac’s Tea Room with our online friends Sharlene Moore, Flora Buchler, Ruth Atkinson, and Hope Stern. The food was delicious and the company was even better. And I even got to meet Flora’s husband, George, and Ruth’s husband, Harry! Later that evening, PJ and I attended Forever Romance's 10 year anniversary party—more good food and company—and then headed over to the Margaret Mitchell House for a special panel discussion with Avon authors Rachel Gibson, Sarah MacLean, Eloisa James, Cathy Maxwell, Susan Elizabeth Phillips, and Kerrelyn Sparks. What a fun night! PJ and Andrea at Forever party. On Saturday July 20, at 10:45 am, Avon Books and Autography LLC made publishing history, hosting the first 20-author digital signing, the first such signing of this magnitude, at the Romance Writers of America Conference in Atlanta. According to Garry Martin, CMO and Managing Partner of Autography, more than 575 signed e-books were distributed to romance readers in the span of the 45-minute promotional event. Here's how it worked. Each of the twenty authors had an iPad or other digital tablet with an Autography application. I was asked to key in my email address. Using a stylus, the author then signed the tablet screen, exactly as she would have signed a print book with a pen. Hitting "enter" sent me an email which was received within seconds. Upon opening the email, I was asked to select the type of format I wanted (mobi or epub) then the book was downloaded. Voila! Signed copy of my favorite books on my PC, Kindle, Nook...whichever device I selected. Here's a photo of Tessa Dare signing a digital copy of her novella, "Beauty and the Blacksmith" for me. And here's a photo of the autographed page on my Kindle. How awesome is that? Thank you, Avon Book and Autography, LLC! Andrea, back again with Friday’s highlights – For me, the top spot for Friday was the Awards Luncheon speech by Kristan Higgins. One minute we were laughing, the next we were shedding tears. What an amazing woman whose books I adore! If you haven’t read her books, you are missing out! That night, PJ and I met Kim, Flora, George, Flora’s and George’s son Will, Vanessa Kelly and her husband Randy, and Debbie Mazzuca (aka Debbie Mason) at an Italian restaurant—more fun and good food! (Are you sensing a theme, here? lol) After dinner, PJ, Kim, and I took a cab to the Avon party. Avon always throws a GREAT party and this year they had a fun photo booth! Saturday’s highlights – The day started with more informative workshops and crazy-fun publisher signings and I was tickled to see Elizabeth Hoyt, Jill Shalvis, and catch up with historical author Alexandra Hawkins and steampunk author Kate Cross (aka Kathryn Smith)! But the ultimate high point was the RITA and Golden Heart ceremony on Saturday evening. What a thrill it was to be there to see Eloisa James win a long-awaited and much-deserved RITA award! She won for her novella, Seduced by a Pirate. And an added bonus was seeing Sarah MacLean win the RITA in the Historical Romance category for A Rogue by Any Other Name, which I loved and reviewed here at the Romance Dish! It's time for RWA GLAM! It's a highlight I look forward to at every conference. The shoes! The dresses! I could go on and on...but, instead, let's just take a peek at some of the high style of RWA 13. That's it, Dishies! Thanks for going along with us on another fantastic RWA National Conference experience. 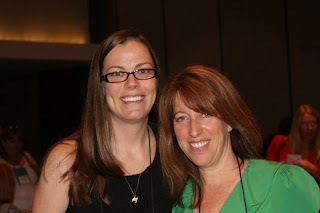 If you'd like to see more of PJ's conference photos, check out her facebook page, RWA Conference 2013 album. If you could go to any conference, which one would you choose? RWA? Romantic Times? DragonCon? RWA Australia, ComiCon? Something related to education or a hobby, like knitting? Let's say time and money are unlimited. Where would you go? Love the pics, Andrea and PJ. I would love to go to a few reader conferences(RT, Authors After Dark) and Comic Con. It would be nice if going to RWA Australia were possible. I could meet Anna Campbell. I'd love to attend RWA Australia too, Jane. Oz is on my bucket list and, of course, spending time with Anna Campbell is always a treat! I think I would definitely go to RWA. It sounds amazing, so glad I could share it thanks to you lovely ladies! I very much enjoyed all these recaps. Thanks for sharing and having these giveaway chances! You're welcome, Anita! Thanks for being a regular visitor here at the Dish! It's a tie for me between RWA and being able to meet all of my fav authors and Comic Con b/c I've always wanted to go. Thanks for the fun posts! Video from Comic Con looks fun, doesn't it? Those digital autographs look so cool! I would love to go to all the different conferences. I think the RT and RWA conferences would definitely top the list. Thanks for taking us with you and sharing all the pictures and stories!! Ada, they were very cool! I hope publishers will do more of the digital signings. Of the conferences you mentioned, RWA is the only one I've been to but I think it would be nice to go to RWA Australia because I love Australia and I could meet my friend Serena Tatti in person. The virtual autographing sounds wonderful. For me, the conference highlight was my first signing at the Literacy Autographing Wednesday night. In the past I've volunteered to work at the signing but this was my first time as a signing author. It was a real thrill. Marilyn, I didn't realize it was your first Literacy signing! For some reason, I thought you'd done it before. Readers, Marilyn is a terrific author who should be on your radar. Come "meet" her when she blogs with us on August 9th. I would love to go to the RWA in the States and Australia, as long as I am wishing I may as well wish big right? Anything book related like the Ritas, RWA, etc - but in the US - not too much of a fan of traveling.Would try to get book buddies to join me, or friends and especially if near family. Thanks again for your generosity in the giveaways. I appeciate it and I know all of us who follow your blog do as well. You're welcome, Pat. We love sharing the books and other goodies that trail us home from conference. I can't think of a specific conference I'd like to attend, but I DO know that as long as my two BFFs were able to join me, I'd attend in a heartbeat. They enjoy reading too, so it could be one of those conferences noted above, but it could instead relate to baking, cooking, crafts, gardening, etc. OHHHHH! We are all into home organization/downsizing, so something about that would be perfect! RWA sounds great. After seeing all your wonderful blog posts, how can I choose anywhere else? Thanks so much for all the great coverage. You're very welcome, LSU Reader! 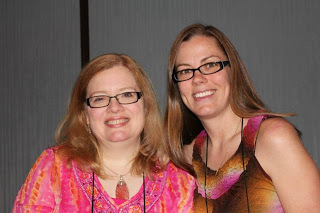 You both made the RWA conference come alive for me. I wished I could have been there every step of the way. Lot's of authors and publishing houses! Books galore! Great food, parties, book signings. Sounds perfect for avid readers. Glad we were able to do that for you, Laurie. The RWA. I have always wanted to go. There seems to be so much going on there and so many authors. Thanks for the great post and pics. I had to come home and sleep for a week just to catch up! lol! The most important thing about shoes at RWA is that they be comfortable! I can't wait for Frost's book, too, savannah!! Would love to attend a Rita or romance author get together. I can see you all had so much fun. I LOOOVE the shoes, especially the red ones in the beginning of the post. Red was a big color this year. The red pair (with the bows) in the beginning of the post were worn by author Karen White. They looked great with the black and white polka-dot dress shown in our July 25th blog. Oh, PJ...again. You and Andrea made my first booksigning SO freakn' special! All my buds did! And I cannot say enough how cool...TWO PJ's??!!!!! It's karma and I with that young lady all the luck! Joanie, off to savor her last turtle....love you both! I know, Joanie. TWO PJs! What are the odds? Vanessa, seeing you and Randy is always a highlight of any conference I attend. Wish we had had more time to hang out! 1. The "Autography" signing is fascinating. Thank you for explaining how that worked. 2. When it comes to glam, I want the cute red bow shoes! 3. I'd have to choose the RWA Australia conference as my dream conference. I'm sure their authors and editors are as passionate about the industry and we are at "RWA USA," and I'd get to see Australia as a bonus. Heck, as long as I've traveled that far, I'd stop in New Zealand and some Pacific islands on the way home. Caro, attending the Avon Autography session was so cool. I really hope we see more of those. Ditto on the red bow shoes. Karen White always rocks the fashion! Love the pics and comments. How I envy you getting to go to conferences! I'd love to go back to RWA again, it was awesome. But I would be thrilled to go to any of the conferences and if time and money was no problem, I would try to hit them all! Debbie, I really hope you make it back to a conference one of these days. I'd love to see you again! Since I live in the Atlanta area, I was disappointed that I couldn't make it to the literacy signing. You eased my disappointment by sharing your stories and pictures. It was the next best thing to being there! Perhaps I will get to meet you in person at another Georgia event someday. Thanks, PJ. I will look into it. BTW, I sent you a FB friend request. We missed you, Cheryl! I am planning to go to the M&M book signing. You should come, too! I would pick RWA Australia since I would love to see Australia and add some romance authors and what a great combination. I really enjoyed all the pictures and what great shoes everyone wore. Visiting Australia is a dream of mine. Would love to make it come true someday! I would definitely choose RWA. I have followed the blogs and pictures for a couple of years now and it’s all so very exciting I would be thrilled to be able to be there. All of those lovely, smiling and happy ladies enjoying each other’s company and sharing stories is fabulous. I would love to visit Australia one day and finally meet Anna Campbell. What a sweetheart she is. Her energy is incredible! Thank you all ever so much for sharing these wonderful pictures. Even though I wasn’t able to be there in person, it was fun to go the cyber way! Happy to take you along on the journey, Connie. Hoping we'll be able to share it with you in person one of these years! I would love to go to RWA. The excitement of meeting the authors and the wonderful celebrations. There is a lot of excitement! lol! RWA looks so special that I know it would be memorable to attend. Your photos are lovely. Thanks, traveler. It is very memorable! 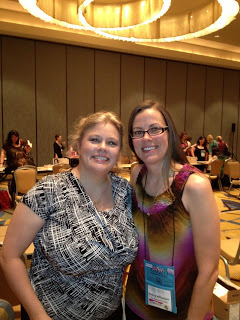 PJ and Andrea, it looks as if you had a marvelous time at RWA Atlanta! PJ, I've been following your picture posts on FB. What fun. 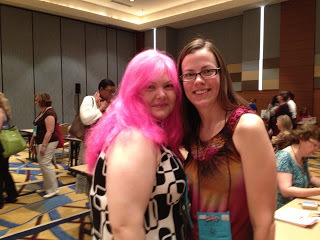 I've been fortunate to attend several RT conventions and one RWA book signing. Planning on attending the RT Con in New Orleans next May. Sounds like a fantastic time in a great city. There are SO many people going to RT next year, Donna! If it wasn't during school, I would be there, too! Great pictures. Thanks so much for letting us "join you" for such good times. The dresses you showed are lovely. Wish I could actually fit into some of them. I'm not a shoe lover, but there were some cute ones. Of the events listed, my favorite would have been the special panel discussion with Avon authors at the Margaret Mitchell House. What a special place and what a great group of ladies. I have only been to one convention, RomCon this past June. It was an enjoyable experience. It was really nice meeting authors whose books I have enjoyed. You get a better appreciation of their books and just how hard a job it is to be an author. Sylvia Day was the keynote speaker, and she flew in (from Australia) with little time to spare. You appreciate just how much effort and expense goes into promoting books. It would be wonderful to be able to attend RWA either here or in Australia (good excuse to go there). I enjoyed myself so much I would like to go to almost any writers conference. librarypat, the Avon panel at the MM House was a lot of fun. They had great questions to answer and some of their replies were hilarious! I would LOVE to go to RWA Australia, gamistress. Two great things in one package! RWA, RT - even Austraila - hey money and time no object, right? LOL. Definitely would choose RWA, RT, and ComicCon. I think all 3 would be fun and lots to see at both. I bet ComicCon would be fun, too, Chris. One of these days! Well FINALLY!! It is always about the shoes!!!! teehee!! Thanks for all the lovely photos! Great recap, y'all, and terrific photos, as always. That's one of the few of me with an actual book! Also as always, I wish my feet would tolerate those cute shoes. I'm definitely going to Dragon*Con. It's a highlight of my year. I'd love to go to ComicCon but am not sure that will ever happen. It's so far away, and I have some misgivings about the crowds. Still, it would be fun to go to some of the TV and movie panels there. Nancy, my husband and I have been talking about going to Dragon*Con at some point. It's so close! I am looking forward to the Romantic Times conference because it is going to be in New Orleans, it has to be fantastic. RWA of course because you get to meet so many romance writers! :) I would love to go to ComicCon too but romance is my favorite! I love your pic of Tessa Dare... She's one of my favorites! It would have to be the RWA for me. So many fabulous authors. RWA seems to have the most romance authors in one place, so I would pick that. You ladies look like you had such a great time! And the shoes are definitely fabulous! Wow, best pics yet. I would be happy to go to any reading event. Sounds and looks like all you guys have such a blast!! I think I'd pick RWA, since it seems to be so well attended. I've been to several of the RWA Literacy signings as well as an RT book signing, and as fun as those were, it would be wonderful to attend a whole conference. RWA will always be first in my heart! I'd love to go to ANY to meet some of the authors I love. Congrats on being able to go and thanks for sharing with us. Thank you for the giveaway too! Per the choices up there, I would say RWA Australia, one shot for two emus, get to see the Down Under as well. Congrats to Terri Osburn and Manda Collins for their first RWA signing, soooooo happy for you both. AND.. thank you PJ and Andrea for being our very own and special CNN for this RWA event, you made us feel like we were there too, thank you.